If I were to be asked, “What is the one food ingredient that I cannot live without?” I would answer “rice” without even thinking.It is comforting, satiating, soothing and filling to my belly and my mind. 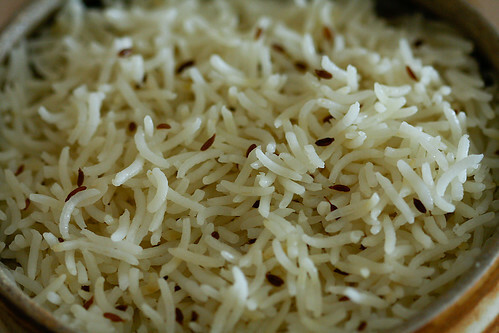 Although I largely eat unpolished organically grown rice, from time to time I find contentment in the opulence of polished long grain basmati rice.I cannot even dream of making pulaos, biryanis and other traditional exotically flavoured rice dishes with anything other than top class Indian basmati rice. Jeera pulao is one dish in my arsenal that perfectly complements a well made dal or a vegetable curry. It plays a beautiful supporting role when a dal or any other gravied vegetable is the star attraction. The additional notes in my recipe notebook read “So simple, yet so tasty.” And I would like to repeat the same again. Most people who try it will be struck by its simplicity and taste. Most Indians of my grandmother’s generation resorted to Ayurvedic cooking. It is knowledge that has been passed down through the generations from the Vedic period, the main source of Ayurveda being Atharvaveda. Ayurvedic ways are relatively inexpensive and a great boon for common aliments like cough, cold, headache, stomach and skin disorders .The ingredients used in traditional Indian cooking also acted as medicine and balanced kapha (water), pitta (fire) and vata (wind), which according to Ayurveda are the 3 main constituents of our body. According to “Secrets of Indian Herbs” a book published by Pathanjali Yogpeeth that my mother got me recently, cumin seeds promote digestive functions, cure pitta, promote intellect, cure cough, enhance taste, and are anti pyretic and beneficial for the eyes. In “Herbs that heal, natural remedies for good health” insomnia, common cold, colic and digestive disorders are a few healing properties of the cumin seed discussed by the author, H.K Bakhru. Apart from weaving their magic into my rice and curries, the miraculous properties of the cumin seed have ensured that I’m devoted to them for life. Tastes great with any vegetable curry or dal. Wash the rice in a colander over a running stream of water, soak the rice in any utensil with enough water to cover it and allow to rest for anywhere between 15 minutes to half an hour. In a medium sized heavy bottomed dish with a tight fitting lid, heat the ghee or vegetable oil over a medium flame. Toss in the cumin seeds and stir until they change colour, about a couple of minutes.Stir in the soaked and strained rice and toss carefully until the rice grains are coated with the cooking fat. Pour in the hot water and salt, lower the flame to medium, cover and cook till done, about 15 to 20 minutes. For a quicker version using the rice cooker, just place all the ingredients in the rice cooker, mix and cook till done. *For a variation try using other whole spices like cinnamon, cloves, cardamom and pepper along with the cumin seeds. 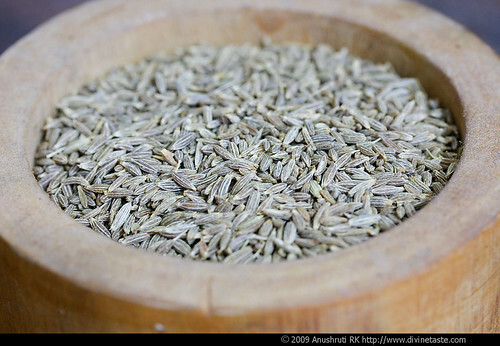 *Disclaimer: The information on the usage of cumin seeds is not meant to replace the advice of a medical practitioner. I love how each grain of rice is so long and distinct. Come to think of it, Jeera is so underrated – at least in my house. Thanks for highlighting the benefits! nice click! 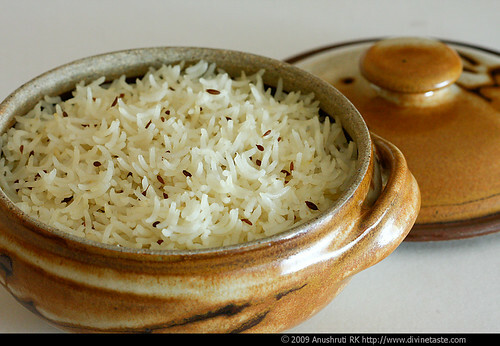 i love jeera rice too!its the perfect comfort food! I've always wanted to try this, urs looks great. Basmati rice is soo long??! Shaheen: I totally agree with you. Jeera is so underrated. 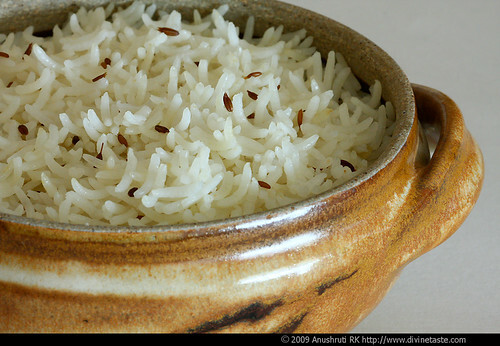 Sharmilee: Good quality basmati rice cooked correctly will yield nice and long separate grains. Try it and let me know how you like it. So simple and beautiful. Love the clay pot that holds the rice. Jeera rice is definitely the chosen accompaniment to many curries at our home. I love your pics. They make the rice such comforting dish! Sheba: Its so true that something so small and common (in the Indian Kitchen atleast) can be so wonderful. Thanks for stopping by my blog! Your recipes look amazing, can't wait to try some! 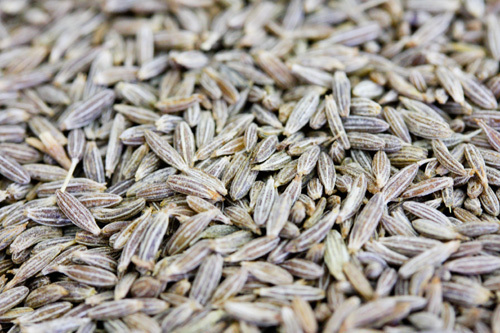 Love the writeup on Cumin seeds; Verily, Meera gets cumin seed (and a couple other seeds) tea every morning after her bath! As you mentioned it prevents colic and aids digestion. Looking forward to you filling up this section on Ayurvedic cooking! My friend just brought over a bag of cumin seeds and was eating them alone. They were so tasty, so I know I'd love this! I stumbled on to your site while searching for jeera rice recipes. I added your link to the "Further Reading" column of my jeera rice post, hope you don't mind that. I would remove the link if you have any problem in that. simone: You are welcome. I'm surprised you don't like basmati which is supposed to be the queen of rice. Are you sure you have tried the right brand? Thanks for your feedback on all my recipes. You should pics as you cook instead of just finished mixture. That way we can get better understanding. I really love the photos. They are amazing!